Coosawattee River Resort is a gated community in Ellijay, on the Coosawattee River, Mountaintown Creek, and is only 10 minutes from the Doll's Mountain boat ramp on Carters Lake, a 3,500 acre Corps of Engineers reservoir in the beautiful North Georgia Mountains. The resort is made up of 8,000 acres of beautiful wooded lots and is only 15 minutes away from popular Elijay mountain biking and hiking destinations like Bear Creek, Riverloop, and Pinhoti trails. Amenities include a recreation center with indoor pool and exercise room, tennis / basketball / volleyball courts, campgrounds, 2 outdoor pools, playground, stocked fishing lake, 4 security gates and 200 miles of roads. Read more about Resort Amenities here. 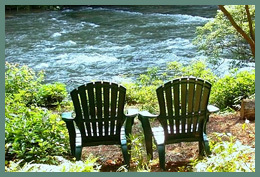 Whether you are looking a new life in the mountains, mountain land as an investment, a terrific place to build a weekend getaway or perhaps your retirement home, we have the best selection in the resort: riverfront, mountain view, trout stream frontage, or just a nice wooded lot on a quiet cul-de-sac. To view Resort Photo Gallery, please click on the image below.